This is our third infographic on the 40 year legacy of the Islamic Republic of Iran on the eve of it’s 40th anniversary. In this infographic, we focused on the affects of the corrupt policies of regime officials on next generation Iranians. Addiction has spread to children between 8-11 years of age. There are more than 7 million child laborers in Iran. Child laborers work around 12 hours a day. 40% of the unemployed are university degree holders. 42% of schools lack heating systems. There are thousands of makeshift classrooms in Iran made of mud bricks. More than one in five children in Sistan and Baluchistan province suffer from mal-nutrition. 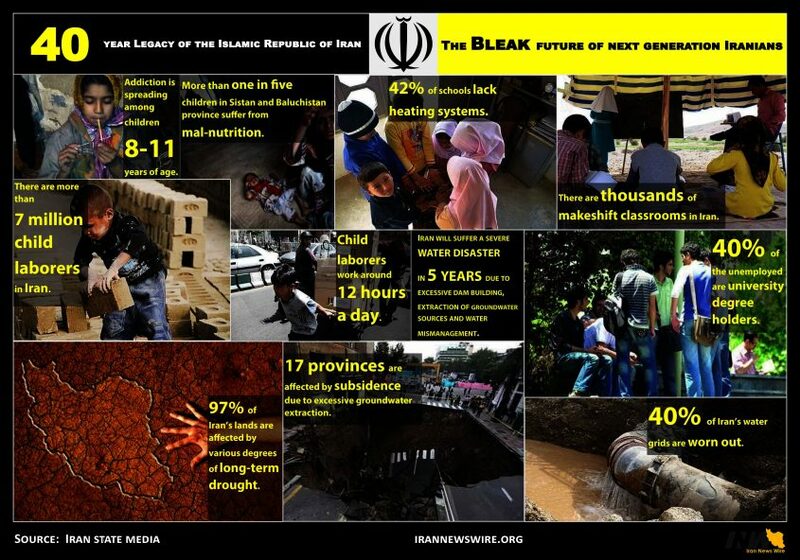 A severe water disaster will strike Iran in 5 years affecting next generation Iranians. According to official sources, the upcoming disaster is due to the excessive building of dams, extraction of groundwater sources and water mismanagement. 97% of Iran’s lands are affected by various degrees of long-term drought. 17 provinces are affected by subsidence due to excessive groundwater extraction. 40% of Iran’s water grids are worn out.